This past week was a volatile one for US stocks due to the latest trade talk news and Fed’s interest rate review. The Dow Jones marched roughly 270 points higher by Tuesday’s session as stocks climbed into Wednesday’s FOMC statement release, but gains were quickly halted by trade war headlines that suggested some White House officials claimed US-China trade talks could be breaking down. The news was quickly countered by comments from President Trump that trade talks with China ‘are going very well’ still, but markets were unimpressed with the update that has been heard several times before. But, investors celebrated the following day following the Fed’s renewed dovishness and easy-money stance on monetary policy which sent equities rocketing higher. 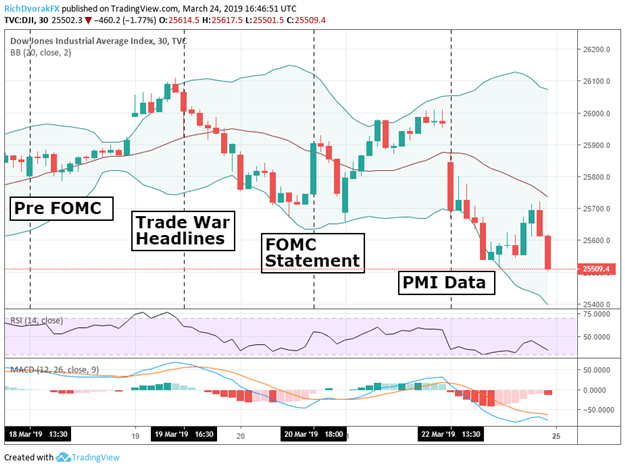 Gains were tepid, however, considering the Fed’s quarterly update of economic projections showed lower forecasts for GDP growth, inflation and employment. Friday’s PMI data out of the Eurozone and US stoked concerns over slowing global growth as manufacturing and services sectors both showed serious weakening. In fact, France’s composite PMI contracted below 50 to 48.7 and Germany’s manufacturing PMI dropped to a dismal 44.7 while US manufacturing PMI fell to a 21-month low. Consequently, stocks came under immense selling pressure with the Dow Jones and SP500 finishing the week down -1.31 percent and -0.75 percent respectively. 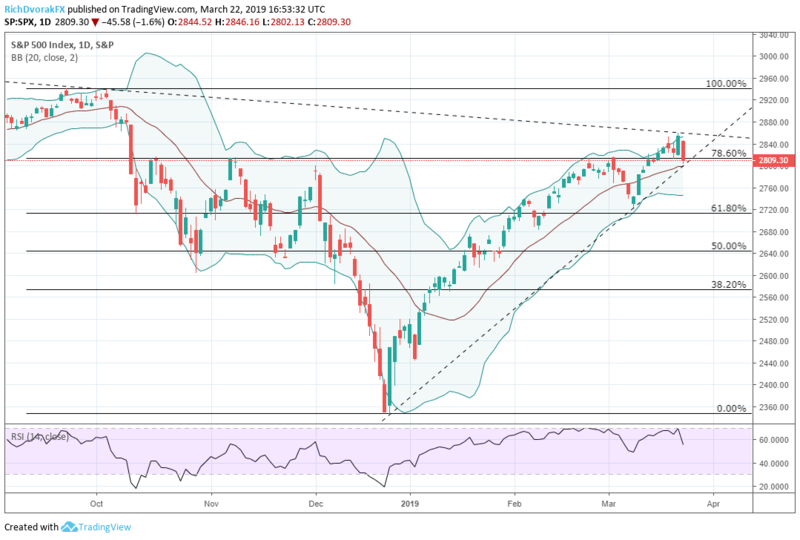 Equities now appear to rest at a critical level and the stock market’s next direction looks like it could be determined by this coming week’s price action. The SP500 price sits slightly above 2,800 now which is an area that can be viewed as support seeing that it previously acted as heavy resistance. The index price also trades around the 0.786 Fibonacci retracement line drawn from September’s high to December’s low – a key technical level serving as additional support. Moreover, stocks also rebounded off Friday’s intraday lows when SPX touched uptrend support from where prices bottomed on December 24 and March 8. That being said, downtrend resistance is now in play and can be viewed as a crucial hurdle for prices to break above in order to continue bullish momentum. 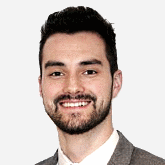 Despite the tear above 2,800 stocks experienced after finally breaking through that resistance level which dated back several months, the recent move higher now appears it could be a ‘fake-out breakout.’ If equities fail to reaffirm its hold above this price area, bullish conviction may quickly deteriorate and put the stock market under some serious pressure which could send the SP500 to the 38.2 percent Fibonacci retracement line drawn from March’s high and low around 2,780. 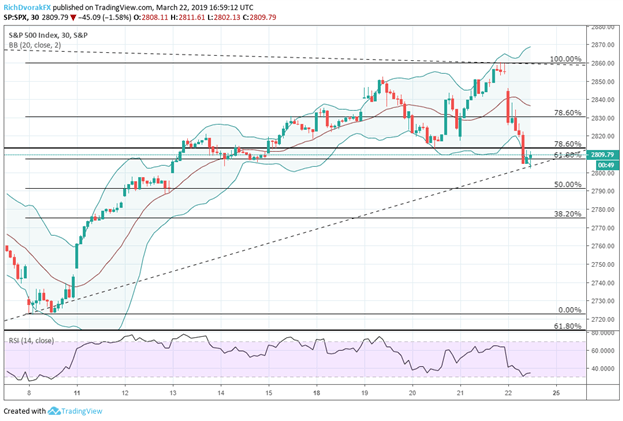 On the contrary, if the uptrend does continue, SPX prices could head back to test the short-term 78.6 percent Fib near 2,830. For volatility, fundamental factors such as upcoming high-level trade talks between the US and China, inflation data and even ongoing Brexit uncertainty can deliver expected and unepected jolts. 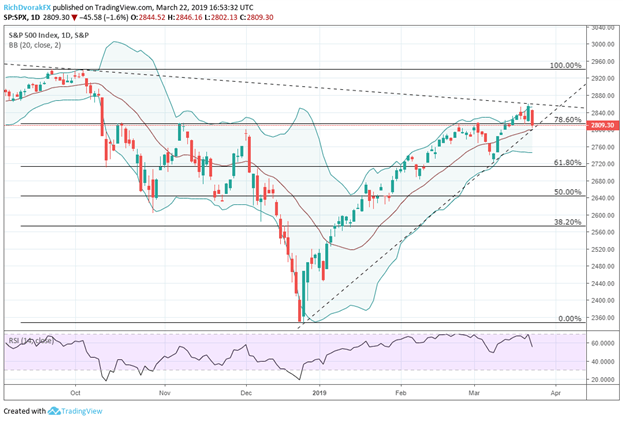 Stock traders should also continue monitoring Boeing and FANG stocks to potentially serve as bellwethers for performance in the Dow Jones and SP500 next week.